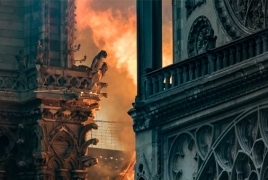 PanARMENIAN.Net - Detailed 3D maps of the iconic and historic Notre Dame Cathedral in Paris, including shots from the “Assassin’s Creed: Unity”, hold out hope for accurate reconstruction after it was devastated by a massive fire Monday. Both the ceiling and the spire were destroyed, as well as internal woodwork, GPS World. But the information to restore the cathedral is abundant. Besides photos, art historian Andrew Tallon used laser scanners to create an immaculately accurate model of the cathedral, as reported in this National Geographic feature.